Rabbi Nina Perlmutter served as our spiritual leader from the Fall of 2009 to February of 2015. Before retiring early to study for ordination, Rabbi Nina headed Philosophy & Religious Studies at Yavapai College in Prescott, Arizona, where her favorite classes included Ethics, Environmental Philosophy, World Religions, and Science, Religion & Philosophy. Now Emeritus Faculty, she continues to teach Jewish Studies and Environmental Ethics. Her background in those areas, and her passion for sharing joyful and inclusive Judaism informed her rabbinate and approaches to Jewish learning. 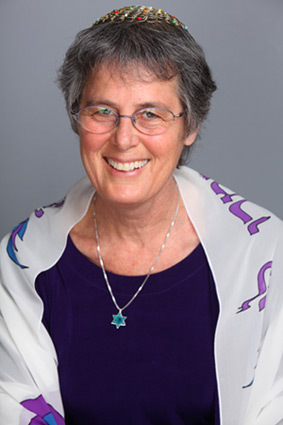 Rabbi Perlmutter was ordained at the Academy for Jewish Religion California, a trans-denominational seminary in Los Angeles ( www.ajrca.org ), with additional graduate level studies at Spertus College for Jewish Studies in Chicago. She founded and still serves as President of the Chevra Kadisha of Northern Arizona, an independent Jewish burial society. Committed to interfaith dialogue, she is a member of the Northern Arizona Interfaith Council and Shared Earth Network. She is the first designated Jewish contact person at Grand Canyon National Park (South Rim). Rabbi Nina is a member of both the Greater Phoenix Board of Rabbis and the Board of Rabbis of Los Angeles. She is married to Tom Brodersen, a Certified Jewish Meditation Teacher. Together they have led Jewish Meditation retreats and hand-built two passive solar homes.